Well as you already know it is pointless and completely harmful to try and physically dominate a Chow! The worst thing you can do! It seems very simple to me so I apologize for stating the obvious but he isn't a dog that you can allow off leash in the front yard. I would never allow any dog off leash in a yard that wasn't fenced, especially in front of a road. What is the point? It's dangerous regardless of the breed. Too many distractions and risk. If you want him out front with you I suggest using a long leash tie out. As far as all this alpha stuff and dominance I see no point to any of that either except destroying trust and your relationship. Chows respond to love, trust, and positive training. I will never understand where all of this you must be the 'alpha', you must be 'dominant' to own chows. Trust me I've never tried to dominate any chow I've ever owned and I currently have two very sweet and well behaved 8 year old babies laying at my feet. Would I trust them to come when called in the front yard when a squirrel ran by? Heck no but I wouldn't put them in that unsafe position either. Just love him, be sweet to him, and when you want to train him please use only positive reward based training techniques. Buy a secure tie out for the front yard. Problem solved. Recall is never 100% and always a risk. Every single day I read some story about a dog that got loose and is now facing a death penalty for killing a cat, bunny, chicken, or fighting another dog. It is your job to keep him safe, not dominate him. I agree with Laura 100%. Never trust any dog, let alone a Chow to recall. It's just not likely to happen when you need it most. I do think you have to establish an 'alpha' position though. But my take on this is more who is the pack leader rather than dominance. To convey this properly, I believe you need to have the dog understand that you control his resources. It's not enough to have a bowl of food magically appear at his feeding spot so he can eat. The dog should see you preparing the food, place it in the bowl, and then wait patiently until you place it down for him. He needs to know that you gave him the food and he has earned it. I've seen way to much Caesar Milan method on wrestling a dog to submission. This creates an unhealthy atmosphere and is really just begging for a negative response. Basic recall training shows you to attract the dog to within your reach. Whether it be treats or praise, the dog needs to come to you. When you go to hold the collar there should be no pull or escape attempt. This requires a calm dog who is comfortable. Grabbing, pulling, wrestling, pinning is never going to accomplish that. 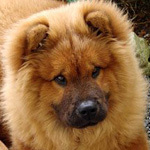 I have three Chows at the moment, 2 males and a female. We use a trolley run for the back yard even though the yard is gated. Let's face it, dogs dig and can wiggle out of the smallest gap. Extra security I guess. They go 1 at a time, since (like recall), I don't trust them to be unsupervised together...males can fight, none are altered, female goes into heat...etc. They can stand at the open door and will wait until the trolley lead clicks before heading off. So, they are well trained, but I still wouldn't risk leaving that door open for any period of time. Thank you both for your help, although I do not agree in regards to the dominance issue. No dog pack in nature is without a rank structure. It is essential to the pack on who is the alpha (who leads and controls the direction of the pack) and who is not. The biggest problem over and over again that I have seen in potential chow owners is that because they are cute and cuddly, that as pups they are not shown who runs the pack and once they feel they are in charge there is no way to break them of this. And your family construct is certainly regarded by them as their pack. Furthermore any time in nature that the position of alpha is challenged, if not defended the opposer takes this as a sign of weakness and he or she asserts them selves as the alpha male or female in the pack. This could not be more true of chows in that they are so ancient a breed that they are some of the closest to the wolf and therefore they are extremely close to a primal pack mentality. Thank you both so much for your help. I was simply hoping that someone might have better insight on training a chow for recall, as other breeds certainly are capable of this. I now understand this is just not within the scope of this breed and will forgo any further attempts to train him to do so. Once again thank you. Based on recent studies, alpha dogs do not exist. Scientists prefer to call them the breeding male and breeding female. Just like in a human pack. So alpha rolls and such do not occur in the wild within a pack of wolves. So this is not the norm. Here is an interesting read regarding dominance in wolves by Dr David Mech. And here is him talking a bit about it. And regarding recall, my dogs also do not respond everytime when distracted either.